Internet consultant, and the delegated administrator of the ccTLD for Uganda (.ug). 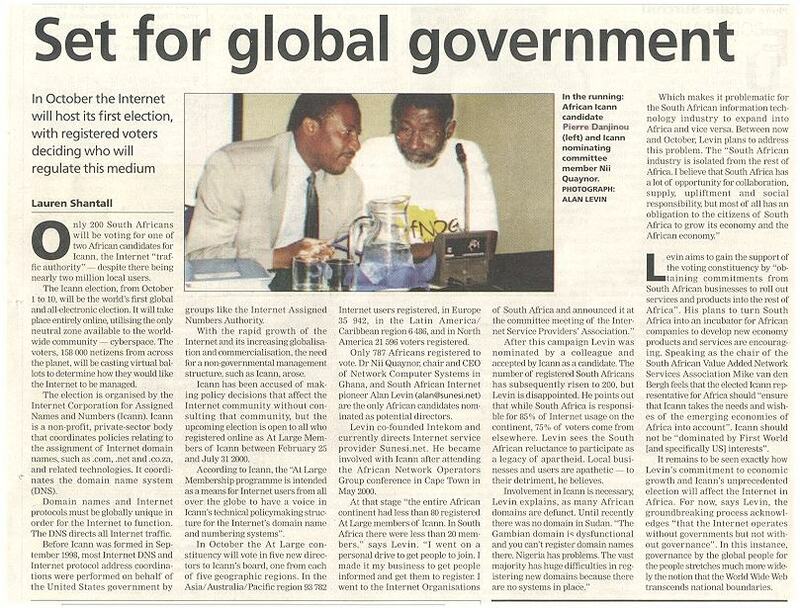 He helped build Uganda's first networks, and currently runs the East Africa Help Desk. He is a member of the Board of Trustees of AfriNIC. He lives in Uganda. Also among the conveners of Afnog, and is currently a member of the Icann Nominating Committee. Dr. Nii Quaynor is Chairman and Chief Executive Officer of Network Computer Systems (NCS), Ghana. Dr Nii holds a Ph.D. in Computer Science from the State University of New York at Stonybrook. He is president of the Internet Society chapter for Ghana, and has been deeply involved in the formation of AFNOG, the African network operators group, and in the organization of AfriNIC, the emerging regional Internet registry for Africa. Dr Quaynor is elected ICANN @ Large Director nominee, member of the DNSO (elected June 2000). cctld administrator for .gh. Director of UniForum SA (http://co.za). UniForum SA currently administers the co.za domain name space, which is the largest zone in Africa and accounts for approximately 95% of South Africa's namespace. Financial Director, Vice Chairperson of the board, Responsibilities for legal matters and Joint spokesperson. Attended and actively taken part in the ICANN meetings held in Singapore, Washington, Berlin, Cairo and Yokohama. Calvin has participated in AFNOG, AfriNIC and Ripe NCC, ISOC and INET events. Self-nominated and endorsed by 51 @large members. 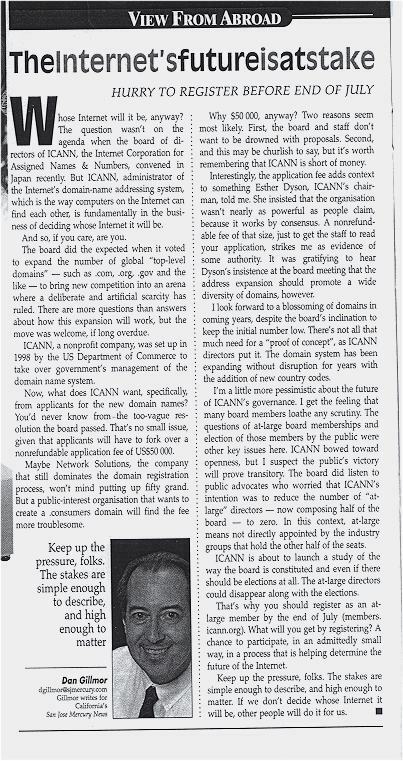 ICANN director candidate for Africa. Internet Infrastructure and Services Consultant. Director of Internet and Data Transmision at CAFE Informatique & Telecommunications S.A., i was in charge of seting up the first Internet Node in TOGO (1997). First vice-president of Internet Society TOGO i'm deeply involve in many Africa internet Organisation such as AFNOG (Afican Network Operator Group) and AFRINIC bootstrap process. Member of gtf-icann a francophone expert group for Internet Governance In Africa support by INTIF i attends all ICANN meeting since 1999 where i'm active memeber of ISPCP and ccTLD constituancy of ICANN. An ebusiness consultant at the Future Perfect Corporation. He has a BSc majored in Computer Science and Industrial Psychology plus an MBA from the University of Cape Town. Alan was an ICANN @ Large Director nominee, active member of ISPA (South African Internet Service Providers Association), Executive Council of CITI (Cape IT Initiative), and has been involved with the formation of AfriDNS. Non-commercial domain name holders (ncdnh) Names Council of the DNSO. Tarek Kamel is a member in the Board of Trustees of the Internet Society and the co-founder and Secretary of the Internet Society of Egypt (ISE), an ISOC chapter. Kamel founded the Communications Department at the Information and Decision Support Center IDSC/RITSEC. He is managing the main Egyptian Internet gateway, servicing over 50 commercial ISPs and hundreds of government organizations. Kamel's work extended into liberalization issues such as a tax reduction for ISPs as well as a government/private sector partnership to serve the Egyptian Internet community. He has actively participated in the establishment of community centers in remote areas to bring the Internet to the have-nots. Head of the Future Foundation and ISP champion. Ant has run the ISPA in South Africa since it was formed in 1996. Leading researcher covering African internet over the past 5-6 years. please send your details so we may add you to this list.